What YouTube data analysis options does MAXQDA offer? YouTube videos are often commented on by viewers, and sometimes their comments sections even turn into forums for extensive debates, for instance in the case of videos on political topics. These comments can be very interesting to researchers working in diverse disciplines in the social sciences, as well as in market or opinion research. MAXQDA allows you to import comments posted on a YouTube video into an open MAXQDA project and have them coded automatically. Additionally, you can import any transcripts or subtitles provided with the videos, which means you don’t have to transcribe them manually. What is the content of the comments posted on the selected videos? Which words are used most frequently in these comments? How have viewers rated the selected video? Which comments are replied to most frequently and which not at all? How do users communicate with each other? What is said in a video or in certain scenes? To import YouTube data into your MAXQDA project, first open the YouTube video in your browser (e.g. in Chrome, Firefox or Safari) and copy the complete link from the URL bar to the clipboard. Go to Import > YouTube Data in MAXQDA. You will then see the following dialog box. If you have saved a link for a YouTube video to the clipboard, MAXQDA automatically enters it in the first field and retrieves the corresponding video information. If you already have the dialog box open, you can paste a link from the clipboard into the field at any time and then click the button Retrieve video information. In the upper area of the dialog box, MAXQDA will display how many comments and how many transcripts or subtitles assigned to the video are available to download. Please note: YouTube does not allow you to download transcripts/subtitles for all videos, even if subtitles are displayed on the YouTube page of the video. Import only top level comments – If you choose this option, the replies to comments are ignored. Autocode comments – If you select this option, each comment is automatically coded with a code. The code indicates how many replies were made to the comment. You should leave this option activated to give you easy access to the texts of comments later. Include times in transcript – If you select this option, the corresponding times in the video times are added at the beginning of each line of the transcript. This is useful if you don’t need to match the video to the transcript (in that case the times are displayed as MAXQDA timestamps at the beginning of each line). 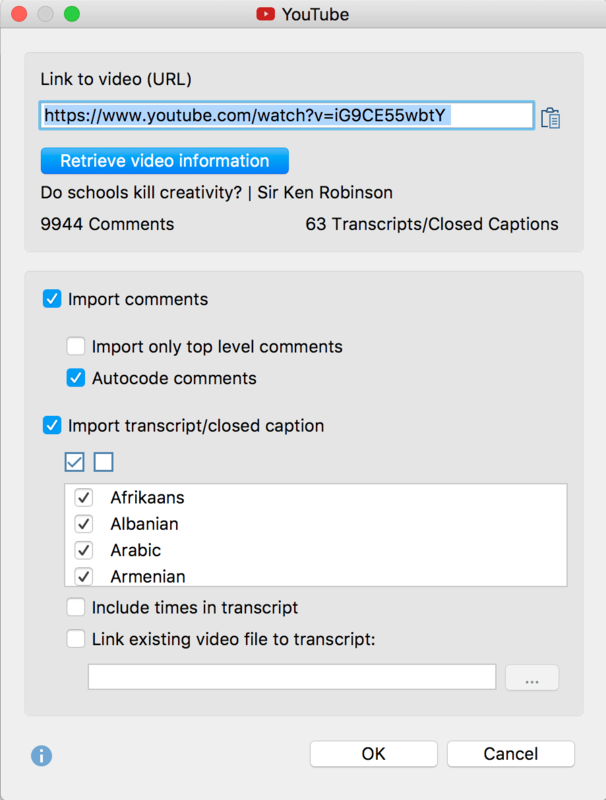 Link existing video file to transcript – If you have downloaded the YouTube video, you can link it directly to the transcript. To do this, simply tick this option and select the video file by clicking on the three dots. Please note: You can link video files to their transcript at any time later: MAXQDA saves the corresponding times during import and displays them later as timestamps. What happens when you import comments from YouTube? Comments are compiled in table documents, 1,000 comments at a time, in the “Document System”. These table documents are labeled with a YouTube icon. These table documents are stored in a document group whose name contains the video title and the import time. The corresponding document group memo contains more information about the video, such as the publication date and the number of likes. A new code named “Autocode <Video Name and Import Time>” is added to the “Code System”. This code contains the subcode “Comment at top level with…”, where as many subcodes are added to the code as there are different frequencies of replies to a comment. All comments are coded with the code according to their number of replies. The second subcode is the code “Reply to comment”. All replies are coded with this code. Activate all the documents containing the comments of one (or more) videos. Activate the code “Comment at top level with…” including all subcodes. Top level – Indicates whether the comment is a top level comment (i.e. not a reply). The cell will either contain the word “yes” or <empty>. Replies – Number of responses to a top-level comment. Always 0, if it is not a top-level comment, that is, a reply. Please note: The YouTube comments import function is limited to the 10,000 most recent comments per video. The transcript text is displayed in the “Document Browser”. In the example, a video file has been assigned to it such that timestamps can be seen in the column next to the paragraphs. Clicking on a timestamp plays the video at the corresponding position.